UPDATE: The new format of Expats Paris Twitterchats will be revealed pretty soon. Subscribe yourself on our newsletter so that, as soon as these are ready, we can send you more details about the Chat's hours. Today, we’d like to announce an update on our weekly Twitter Chats format that kicked off on the 27th August 2015. These have been great and fun ways for us to discuss about different topics related to life and work in France, meet some cool people interested in the same topics, enlarge our network but above all, have some fun. The Expats Paris Weekly Twitter Chats were taking place every Thursday at 4 pm (Paris, France Time) but this time has been modified to 8pm on the same day. If you want see what time that is in your timezone, we've always recommended to use Time and Date. This is a great real-time tool that helps convert it into your local time if you want to join. These chats have been and will always be moderated by our team and Friends in Paris and elsewhere in the world. The Hashtag we have been using will not be changed. It's still #ExpatsParisChat. Each week we will be bringing on special guests to answer questions, offer out and share their expertise with participants. We were extremely excited and honoured to have Michyl Culos, Co-founder and Marketing Director of Parisianist as our first #ExpatsParisChat guest. We have a lot more special guests on the way. Let me briefly talk about Michyl. This friendly Canadian digital marketing addict was adopted by Paris in 2012. Coming from Canada’s West Coast, Michyl was always drawn towards the French culture, living in Montréal for 4 years to work for L’Oréal before jetting to Paris for her Masters at HEC Paris. A world-traveller, entrepreneur and lover of city secrets (with a passion for croissants), she’s pumped to talk all things expat life with us! You can actually find a recap of that Chat right here. Back to the Chat: Who can and how to participate? These weekly twitter chats will still be for, about and with people based in Paris or elsewhere in the world. 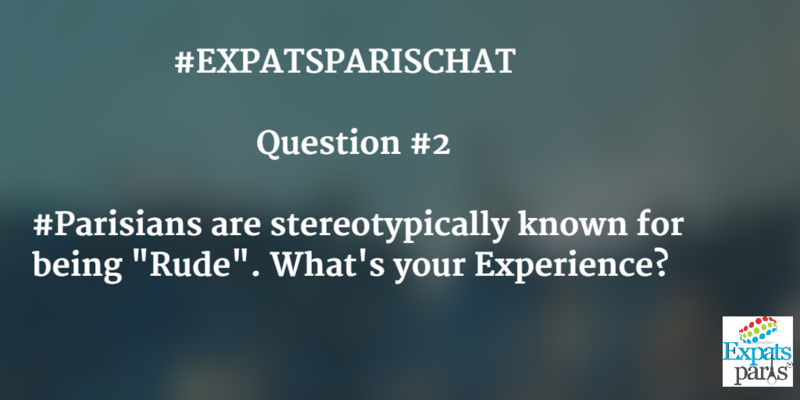 We’re planning to discuss with the help of our guests, about topics related to life abroad in Paris and we’ll be using the hashtag #ExpatsParisChat to facilitate an easy followership of the conversation forparticipants and anyone else who wants to know more about life in Paris. Hey, let me give you a quick overview on how to join our tweet chats. • You must Sign up for a free Twitter account (if you don’t have one yet) by filling out your profile, adding a picture or avatar and follow at least the Five accounts. • You should take a quick look at some of these Mashable’s Beginner’s Guide to Twitter for tips and tricks to get the hang of using this social media. • You may want (not mandatory though) to follow us on twitter first, follow the guest and browse the shared posts on our profiles or other members that share stuff using this same hashtag to see who else may interest you or who else is planning to attend the chat. • Learn how to listen: you won’t necessarily have to say or post anything if you don’t want to. You can just sit there and click on the hashtag of a tweet to see all of the recent tweets around our Hashtag. You can follow this fast-paced and intensive conversation right from your own twitter timeline in a web browser and since we’re expecting a huge turnout, it may be very easy to lose the conversation’s thread. We’re happy to suggest a few number of tools you can use to follow the chat and participate more easily. If you’re using a twitter management tools like Tweetdeck or Hootsuite, you’ll just have to set up a search for our hashtag and all of the tweets with this hashtag will come up in the search window. • Before joining the chat, make sure you give your followers a heads-up by letting them know that it’s “High tweet volume warning hour”. Invite them to join the chat if you think the topic is interesting for them. • Don’t forget to include a “.” in front of an @ if you want your tweet to show up in all feeds. • It’s actually fine to get in and out of the chat when you feel like. You shouldn’t feel guilty if you’re not able to stay up to the end of the chat. • Don’t forget to be polite and very positive. • Never hesitate to jump in and contribute. This might sound a bit intimidating but, you know what? We’ll be happy to hear from you, trust me! • Don’t forget to identify the person you want to speak to. By using their Twitter handles, you’ll capture their attention. • Our Twitter chats will be about connecting and learning lot of stuff related to Expatriation, entrepreneurship, parenting, culture, cuisine, fashion, travel and many other topics. We’ll appreciate a lot if you can use this moment to show and provide your expertise to other participants. • You should always include the #ExpatsParisChat hashtag in your tweets. If you want to continue the conversation after the 60 minutes chat period, you should follow up with the other participants after the chat. See you in the chat room pretty soon.